The Lucky Charms-inspired IPA will be released at a special event on Saturday at noon! Not so lucky or charmed, I was a day late and a growler short for tasting Smartmouth Brewing Company’s newest brew that’s currently making national news headlines. Named Saturday Morning, it was still under wraps when I recently dropped by Smartmouth’s Pilot House facility in Virginia Beach, making my Dubious Beer Expert rounds. 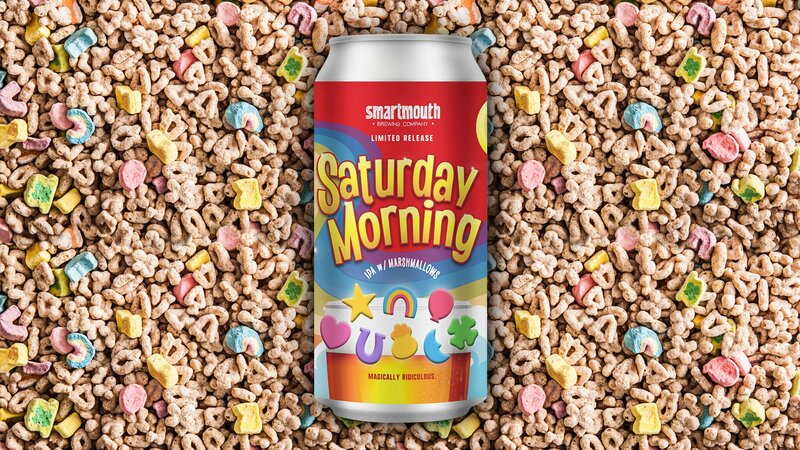 Smartmouth’s Norfolk tasting room at 1309 Raleigh Ave., Norfolk, VA 23507, will celebrate the very limited-edition release Saturday, March 2, at noon during the “Saturday Morning All Day” event. Smartmouth only distributes in Virginia, and is unable to ship beer, so you’ll pretty much need to visit the brewery to try out Saturday Morning. The beer will also be available, in draft only, the same day at Smartmouth’s Pilot House brewery at 313 32nd St., Virginia Beach, VA 23451. A recently renovated post office building, the Pilot House was full of activity and joyful noise despite the stormy conditions the night of my visit. About half the crowd consisted of a couple dozen people attending a baby shower in one of the two open, table-filled tasting rooms, with several of their kids running around and playing board games. Even though the Pilot House’s address is on 32nd Street, their parking lot is around the block, off 33rd Street. Enter the building past the food truck area through the large back porch that looks like it used to be the old post office’s loading dock. At the long narrow table in front of the glass-encased beer tanks, Manager Brittani supplied me and my tasting peeps Sean and Jamie with a flight of nine samples. Learn more about these and other Smartmouth beers here. I found our first sample, the Safety Dance Pilsner, to be light and crisp. Sean and Jamie agreed and noted a very subtle citrus taste. “It’s a good beer to have when you’re having more than one,” Sean said. It turned out to be their favorite of the flight. Brittani had mentioned that it was the Pilot House’s best selling draft. Like Smartmouth’s Lucky Charms-flavored Saturday Morning, the amazing Chocolate Chip Cookie Cowcatcher had complex flavors capable of flashing you back to childhood memories. A very dark, smooth beer with a creamy, tan head, the rich chocolate, vanilla extract, and brown sugar flavors were easily identifiable. The Pilot House releases a new beer about once a week, Brittani told me, and this week’s was Random Glassware Double IPA. You could easily smell the guava and floral notes, which carried over to its pleasant aftertaste. The Alter Ego Saison’s banana walnut flavors smoothly faded in your mouth, a dry finish reminiscent of Safety Dance, Sean thought. Murphy’s Law Amber Ale was totally smooth, with no bite at all, Sean and I thought. I picked out some cinnamon notes. All of us found it to be very drinkable. Game On IPA was light, tropical, fruity, and floral. I could pick out the banana and grapefruit flavors in its smooth finish. Cowcatcher Milk Stout, a less complex cousin of the Chocolate Chip Cookie Cowcatcher mentioned earlier, Sean found to be delightfully smooth despite the strong chocolate and coffee flavors. Full-bodied and delicious, it was my favorite of the flight. What do you think about beer designed to taste like cookies and kids’ breakfast cereal? Do you plan to go to the event? Tell us in the comments! 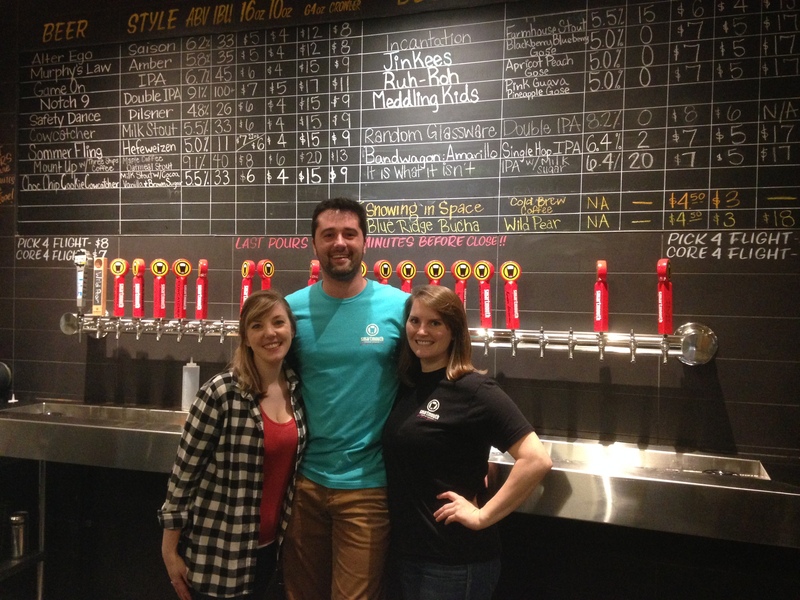 Check out our Dubious Beer Expert's last adventure at Pleasure House Brewing!